I suspect that most readers aren't familiar with the name of this pocket cornet, but it was given to it by Nick DeCarlis. 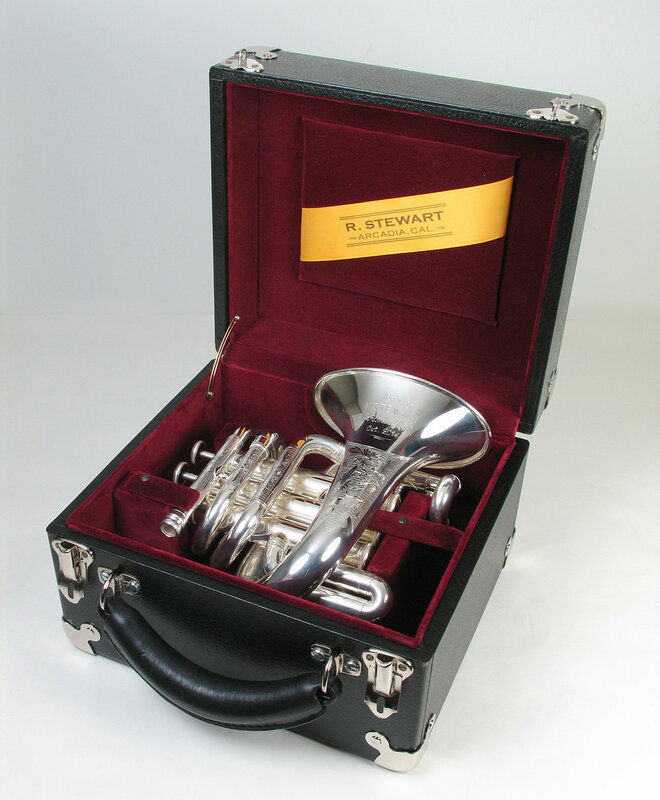 Nick also made the beautiful carrying case for this cornet that is pictured below. Caduceus is the winged staff of the Greek god Hermes that is surrounded by two coiled snakes. We are most familiar with this as a symbol used by many in medical fields, although the correct medical symbol is the staff, with a single coiled snake, of Asclepius, who was the Greek deity that was associated with healing and medicine. Regardless of these facts, Nick was reminded of the Caduceus when he saw the way that the mouthpipe and bell coil around the valves. This rather unusual design was not inspired by snakes or gods, but rather a one of a kind pocket cornet built by Adalbert Riedl around 1900. This is pictured on my page on Riedl's echo cornet and when Jeremy Cruz saw it, he asked me if I could make one like it. There were several challenges in copying this tiny cornet, including the Berliner valves and very small size over all. I told Jeremy that I wasn't willing to make a set of valves just for this project, but could modify a modern valve section to work. Another requirement that I stipulated is that it should be a full size Bb cornet acoustically. When I enlarged the photo of the Riedl cornet to approximately full size, it became obvious that the taper and flare of the bell was small and would result in a small and excessively bright sound. I spent at least 8 hours struggling with this design and was not happy with it. The biggest hurdle in making a pocket cornet or trumpet is bending a full size bell to fit the design, so I decided that I would bend the bell as small as possible first and then design the cornet around that. I was able to get the bell length down to just 6 1/2" and then formed the bell to the oval shape afterwards. Knowing that forcing the bell into an oval would change it acoustically, I carefully stretched the metal so that it would still be somewhat close to its original characteristics. Once the bell was done, the rest of the main tubing design fell into place more easily. The fifth photo shows the Riedl cornet at approximately full size next to the full size drawing of the new design. The oval bell rim measures 5" by 3 1/4", which adds a lot to the compact nature. You may notice that there are no waterkeys on this cornet. Since the visual effect of this design is important, I stressed to Jeremy how much they would degrade the look and I was happy that he agreed. There are at least five spots where water will collect in the curves, so it wouldn't make sense to install only one or two waterkeys anyway. In practice, the player must occasionally blow all the water through the valve section, into the larger tubing and then rotate the instrument once to let it run out the bell. This is not an insurmountable compromise. Once the instrument was complete, I sent it off to James McKenzie in Lawrence, Kansas for the custom engraving. Jeremy wanted extensive decoration inspired by the engraving on Conn instruments from the 1880s and James was able to deliver it spectacularly. Very sadly, this was the last engraving commission that James was able to finish. He didn't tell me at the time, but he got hit hard with fast moving cancer and died just months later. After getting it back from James and final polishing, it was then sent to Anderson Silver Plating in Elkhart, Indiana for the silver and then to Nick DeCarlis to have the case made. Nick was able to make a very beautiful case for protecting the cornet and displaying it very well. While he had the instrument, Nick took it on one of his jazz gigs, just to be sure how good of an instrument it is and with excellent results. After completing its travels and back in my shop, Jeremy was finally able to come and see it for himself and take it home. He was pleased. The seventh photo on the right shows the Caduseus Pocket Cornet next to a full size Bb trumpet to emphasize the size. The eighth shows another Caduseus cornet made for Jim Bell later the same year. This one is even shorter at 6 3/8". This was engraved by Sherry Huntley and then lacquered. I was surprised to get an order for yet another or these from trumpet professor Mark Ponzo. The last three photos show this cornet, with lots of engraving by Sherry Huntley.